Marloth Kruger Whispering Ants - Marloth Park Accommodation. Marloth Kruger Whispering Ants is a beautiful holiday home in the Marloth Park Conservancy that borders the Kruger National Park, separated by the Crocodile River. The house has a elegant rustic look and is surrounded by bush veld, bird and animal life and provides for tranquillity and privacy. The house is fully furnished and has three en suite bedrooms, spacious lounge and dining area, fully equipped modern kitchen and a spacious TV lounge with full DSTV. Outdoor facilities include a spacious veranda with dining area , braai area enclosed by a boma, and a swimming pool. 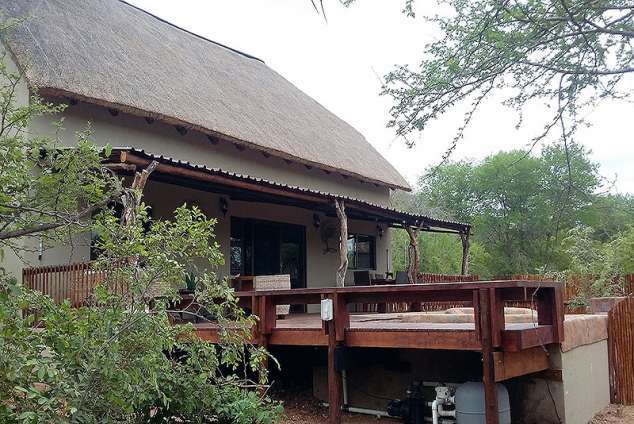 The house is a short walking distance from the Crocodile River from where one can look into the Kruger at various look out points and enjoy a sundowner or just roam around whilst enjoying the abundant animal and bird life.Your chances of seeing the Big Five in the river bed are excellent. You can also hire a bicycle or bring your own and cycle around Marloth Park or on paths next to the river and observe wildlife whilst doing so. The Crocodile Bridge entrance gate into the Kruger is only 14 km away and you can undertake self drive day trips into the Kruger. There are also various companies offering day trips in open safari vehicles into the Kruger. Guided bird watching walks and nature hikes where you can learn more about the bush veld and wildlife are also available. Marloth Park has two small shopping centre's with grocery stores, butcheries, liquor stores, delicatessens, laundries,a coffee shop,gift shops and an internet cafe. There are also five good restaurants where you can enjoy good meals. Two lodges offer spa treatments and massages. Marloth Park is also close to other attractions like the Panorama route, Swaziland and the Makhonjwa Geotrail, which is a proposed world heritage site. Detail description : Whispering Ants is a beautiful holiday home in the Marloth Park Conservancy, adjacent to the Crocodile River that borders the Kruger National Park.The house has an elegant rustic look about it and is surrounded by bushveld, bird and animal life that provides for privacy and tranquillity. As can be seen from the photographs, the house is fully furnished and has three en suite bathrooms, a spacious lounge, open kitchen and TV area as well as a veranda in front of the house that leads onto a braai and swimming pool area. The house is a short walking distance from the Crocodile River from where one can look into the Kruger at various spots and with a bit of luck see one or more of the Big Five in the riverbed. Both Marloth Park and the Kruger team with an abundance of bird and animal life. You can go on an organised hike or game drive in the Kruger or Marloth Park, or go and play golf nearby or try your hand at tiger fishing. Otherwise, just chill at home and become one with nature. 3476 page views since 05 Oct, 2016.